You can't turn up the luminosity on nebulas, but you can crank up the contrast between them and the sky to reveal more of their wondrous detail. 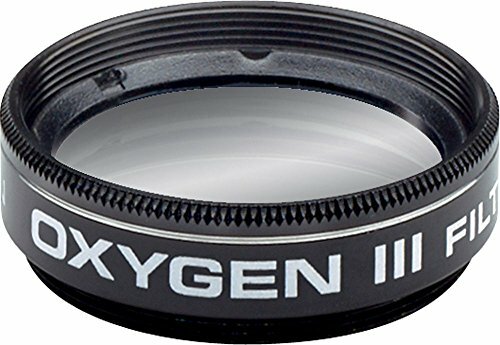 Our Oxygen-III filter provides extremely selective filtration to bring out elusive detail in diffuse and planetary nebulas. It does so by transmitting close to 90% of the light corresponding to the two oxygen-III spectral lines at 496nm and 501nm while completely blocking virtually all other wavelengths. The results are remarkable. You'll see more detail than you ever could before in nebular gems such as the Swan, Ring, Dumbbell, Helix, and Eagle, to name a few. The O-III provides an even greater contrast boost on some objects than the UltraBlock narrowband filter. And for nebulas, every little bit helps! Try the O-III with a low-power 2" eyepiece and take in the whole Veil Nebula. Wow!